Our Gravity Destoner machine is used for removal of stones, glass/ metal pieces or other unwanted particles from various seeds and grains.It is silent running machine and comes with aspiration system for dust free environment. Thorough removal of stones/ metal pieces. Easy to operate & handle. Custom designed as per Seed/ Grain size. Enhances life of spares of Oil Expellers. 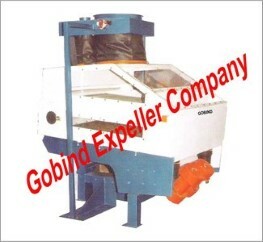 © Gobind Expeller Company have the copyrights for this website, any violation may lead to legal action. Note: Product color/ finishing might be different, buyer should clarify & confirm before ordering.